We’ve been plotting to start the year in style, as negotiations may go underway pretty soon on our pay and conditions. All the quotes on the posters are from our TA survey from last year, expressing how most of us feel in precarious academic work. And just like the posters, QMAC is not going away. Let’s Talk About Work… Could discussions about work also be a useful pedagogical tool? A few days ago, Guardian Higher Education posted an article bemoaning that the £ 9, 000 fee hike was turning students into customers expecting lecturers to be at their beck and call. It mentions conversations with colleagues that apparently reveal a widespread attitude of disrespect, students calculating the hourly cost of a lecture and demands of good grades for attendance alone. As an hourly paid TA, I opened the link quite excitedly, expecting a critique of the entirely preposterous workload heaped on academics the pressures of rising student debt, and the general marketization of UK education’s impact on inspiring and constructive learning environments. Instead, all I read was a frustrating attack on supposedly entitled students with the only solution offered being answering their consumerist demands with snarky responses. Throughout the day my social media timelines were awash with approving links to this article in a way that, despite myself, started to increase my anger at the simplistic, and entirely ungenerous approach to the issues caused by increased fees. An increase that will, at the minimum, place large numbers of students in over £ 27, 000 debt as they exit university and enter an increasingly insecure job market, a market that also affects me as a present and future university worker. Above all, as an active member of Queen Mary Against Casualisation, fighting for better working conditions for one in three workers in higher education who hold non-permanent contracts, what annoyed me the most was the lack of interesting and fruitful approach to the problem of consumer based education. I am talking here about an approach that emphasises the conditions of work in the university and beyond, shifting emphasis away from blaming students towards a way of discussing together what exactly the problems of UK higher education are for all of us who are not in management. The blog post has prompted me to write about how conversations about work, workload and cost can be integrated as a pedagogical method in higher education, a method which may counter the increased reification of education through a discussion about this reification. There is a lot to be said about the contemporary pressures heaped on academics and students alike in the UK right now. As pointed out in this blog on global politics, despite wages falling in real terms, ever increasing casualisation across the Higher Education sector and catastrophic pay negotiations, academics continue to be perceived as relatively privileged workers. More worryingly, the countering of this narrative has been slow, and discussions with students patchy, which may in part have helped clarify why fees bear little relation to lecturers and teaching associate’s pay. Whilst fees have gone up, so have precarious casualised employment practices for teaching and research staff and real term wage losses for permanent staff. On the other hand, social and mainstream media discourse is increasingly painting students out to be consumerist ‘mollycoddled brats’ who do not understand the value of debate and only want to be spoon fed familiar subjects. Identifying these discourses in articles not unlike the one that prompted me to write this, Sara Ahmed identifies how many such enunciations appear to lay the blame squarely on students whilst harking back to a university of the past which was fundamentally a bastion of racism, sexism and class privilege (not that it’s looking that much better now). The upcoming possibility of implementing the Teaching Excellence Framework does also not bode well, for teaching quality or fee increase. It’s looking bleak all round. Yet, as educators, are we not, at least in the Arts, Social Sciences and Humanities, in an ideal position to think about how conversations about our work with our students might bring about a relationship of solidarity rather than antagonism? Maybe it’s because as soon as I started teaching that both on campus and nationally the fight against casualisation in HE started to gain momentum, but it makes sense to me that talking about our work conditions is an excellent teaching tool. Indeed in a transferrable skills obsessed environment, in which Arts Education must constantly and relentlessly justify its purpose through market adaptable skill sets, I hope that talking about my own conditions might help students reflect on and organise around their own. Last year myself and a colleague from another university went to speak about casualisation at the Goldsmith’s student occupation, an action prompted by the cuts to student support services including dyslexia and disability and counselling services. What we realised, in the first instance, was that our experience as hourly paid teachers spoke directly to the working situation of many students participating in the occupation. With maintenance loans barely covering rent (landlords in the area had clocked how much the loan was), many people we spoke to worked various zero hour contracts on top of studying full time in order to sustain living in London. Many of them understood exactly why we were worried and anxious about our job prospects, and empathised with how some of us felt constantly overworked. After all, they felt the same – they were protesting the counselling services being shut, services that might support them cope with the mounting stresses of being a student. I have seen first hand the effects this stress can have on students. Mine and colleagues experiences of students reveals levels of anxiety and overwork which lead to lack of sleep, emotional turmoil and physical symptoms. However, many students coming straight from school misunderstand how exactly the university functions for the workers within it. I remember that way into my undergraduate degree I used to imagine lecturing as some sort of dream job. As a friend of mine put it ‘a bit aristocratic, sitting around thinking about things.’ A Kant in Königsberg sort of set-up. What research might mean practically as a job, let alone the terror that is the REF, is not something I expect 18 year olds to magically understand as soon as Freshers week is finished. Again here is where demystifying the university itself as a workplace might help. Being in a field that I would wager remains attentive to structural inequalities and materialist concerns, using the neoliberal university as a constant example in seminar discussions, as means of also having meta-level conversations about our relationships as educators and students can work on pedagogical and political levels. These are also conversations that might lead to reflections on about their own work places. Because most of them do work. When I’m teaching I always start the first class with a conversation about emails. However, I always try to frame it in a way that isn’t about chastising them about daring to bother me after 6pm or on weekends. Rather, I ask them to consider why I am asking about this? Why might it be undesirable for me, but also them, to be available at all hours, never mind what Jo Johnson says? I am lucky to be teaching subjects which leave a lot of room for tying academic readings to contemporary apparatuses and ideologies. I give them articles to read about unpaid internships and protest by cleaners, asking them what is valued in different people’s assertions about these? What and how is work valued, and why should we accept it? Reification is a difficult word to grasp, but the worsening of the university space into an career and outcome focused environment for them and for me also provides the easiest way to depict its meanings. I also get to class early and speak to students in the corridor and as we are leaving the room. Objectively yes, this could be perceived as more work, but in the longer term it is also a rapport of friendliness, honesty, openness and hopefully solidarity that might pay off in the long run. When students and teachers alike can discuss struggling to pay the rent and the extra work they’ve both had to do on the weekend, maybe misunderstandings such as depicted in the Guardian article could be avoided and our teaching and learning environments can develop into politically and socially dynamic spaces that look for commonalities in our differences. At Queen Mary, as part of attempting to expand these conversations, a group called Material Matters has been set up as an initiative to create conversations between staff and students about contemporary issues – including work. The next one will be held on the 28 of January at 18:30, and will discuss the precarity of work we all find ourselves in. QMAC will be part of this conversation, and we would urge any of our supporters, whether students, permanent staff or academic support staff to join us in hopefully finding ways to fight together rather than each other. See you there! We would like to state our solidarity with the students currently occupying London Metropolitan University’s Cass building in protest against the selling off their Aldgate campus. As a group of casualised university workers, we are outraged by the course closures and job losses that will result from the ill thought-out move to the Holloway campus and the impact this will have on staff and students alike. It is imperative to show support to those who are most affected by the mismanagement and profit driven solutions implemented by university management, particularly as attacks on Higher Education (HE) continue, resulting in the steady increase of casualised and insecure jobs across the sector and the cutting of courses across many universities in the UK. Invariably, as we can see at the Cass, those who bear the brunt of these measures are working class and POC students who comprise a large number of those studying at London Metropolitan University, due to its history and location. The specific cutting of arts courses also contributes to making the artistic and cultural sector the preserve of economically and culturally privileged individuals. We are concerned about the job losses for those who already find themselves in precarious employment positions, such as technicians and casualised teaching staff, but also permanent employees. As we fight for improvement in our own working conditions at Queen Mary, another local campus, we understand the pressures felt by colleagues now facing unemployment in a climate where job security across the HE sector is declining. Finally, we want to express our solidarity with the staff and students of the Cass specifically as students and staff also based in Tower Hamlets, one of London’s poorest and unequal boroughs. The proposed sell-off of the Aldgate campus as prime property development to cover the debt accrued by London Met’s management is not only a cynical move against its own students, but also against the local populations facing displacement and destitution through the obscene financialisation of the London property market – a situation higher education institutions should refuse to participate in. We wish the current occupation and all of the on-going campaigns all the best chances of success. Solidarity from QMAC – Queen Mary Against Casualisation. Are you a TA, an hourly-paid lecturer, or a demonstrator at Queen Mary? Or is your teaching or department supported by these staff? If so, QMUCU wants to hear from you! There are hundreds of hourly-paid staff at Queen Mary who are vital to teaching in the college. As you may know, their hourly rate has remained the same since 2008. QMUCU campaigned last year for a pay rise to proportionately match those of permanent and fixed term colleagues, but our request was unsuccessful. The college has agreed, however, to review pay, terms and conditions of hourly-paid teaching staff with an aim to implement changes in time for the beginning of next academic year. We want to hear from you about your experiences of hourly-paid teaching at Queen Mary to inform upcoming negotiations with the college. Whether you are an hourly-paid member of staff, a PhD student, or a permanent or fixed term colleague, please join us in discussing how we can help improve pay and conditions for these important groups of staff. While there are well over 600 hourly-paid teachers at Queen Mary, these staff are currently under-represented within UCU membership. Please help us reach out to them by circulating this meeting date in your department. All members and non-members are welcome. ‘In addition to doing their research, they are trying to prepare an undergraduate lecture, devise a reading list for a related seminar group and worrying about when they will get time to mark the ensuing pile of essays. But such is life for those who hope to boost their employment prospects by taking on a graduate teaching assistant role. You may be wondering what it is we’re after. So here’s a useful summary of our aims. Good, paid training for all hourly-paid teaching staff (Teaching Associates, Visiting Lecturers and Demonstrators) – as a guideline, School of English and Drama offers £200 for two full days in addition to unpaid training opportunities throughout the year. Disaggregating marking from the inclusive hourly rate, so hourly-paid teaching staff are paid for marking per paper and according to word length (as is already the case in the School of Business and Management), or appropriate equivalent if assessments are practice-based. Clear job descriptions for all hourly-paid teaching staff. Demonstrators paid for preparation (we suggest an hour of preparation for every hour of contact time). We should also minimise use of the demonstrator rate, and ensure that if staff are being asked to perform Teaching Associate roles, such as leading seminars, they should be paid accordingly. In addition, we could recommend the Doctoral college implement a system of monitoring use of demonstrator rates and what tasks they are being asked to perform. Staff at all levels should have access to necessary resources. Hourly-paid staff should be provided with functional office space both for preparation and for holding private office hours with students (current facilities are found to be inadequate). In the long term we want to see hourly-paid roles fractionalised for more stability, and more permanent positions, as in the case of staff who are staying on years beyond the completion of their PhD on precarious hourly-paid contracts. Parity with permanent colleagues on terms and conditions where possible, including learning and development opportunities. This includes access to professional development appraisals, funds for conferences other external training and networking opportunities, and necessary materials. Short-term and hourly-paid contracts are shown to have adverse effects on the diversity of staff in the sector; obstacles to career progression for women, black and minority ethnic and disabled academics require active consideration by the college. 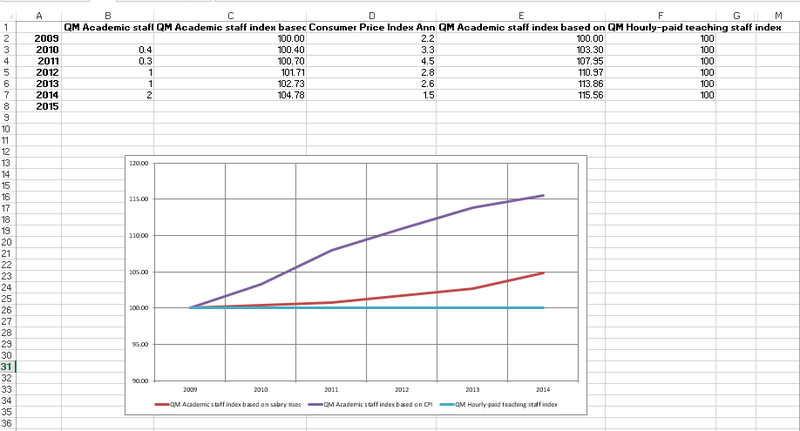 Real term wage losses for Hourly Paid Teaching Staff at Queen Mary since our last pay rise in… 2009! Hourly-paid academic teaching staff at Queen Mary are currently on the same wage as they were in 2009. Having lost out on almost 5% of pay rises to salaried academic staff since then, these statistics show how wages for all academic staff are declining in real terms, with the lowest paid being hit the hardest. This graph shows how the gap between the cost of living (the Consumer Price Index) and the income of hourly-paid teaching staff at Queen Mary is growing at an alarming rate. It would take a 15 or 16% pay rise this year for hourly-paid teaching staff to recover even the same position they were in 6 years ago. Even that would not repay the lost wages from pay rises that were not paid in the intervening years. Queen Mary Against Casualisation call for an end to these poor labour conditions. Together we can win better working conditions for staff, a better education for students, and a more sustainable and diverse university environment. Join us!